, a French physician, wit, and free-thinker, was born Aug. 31, 1601, at Hodenc en Bray, a village jiear Beauvais. 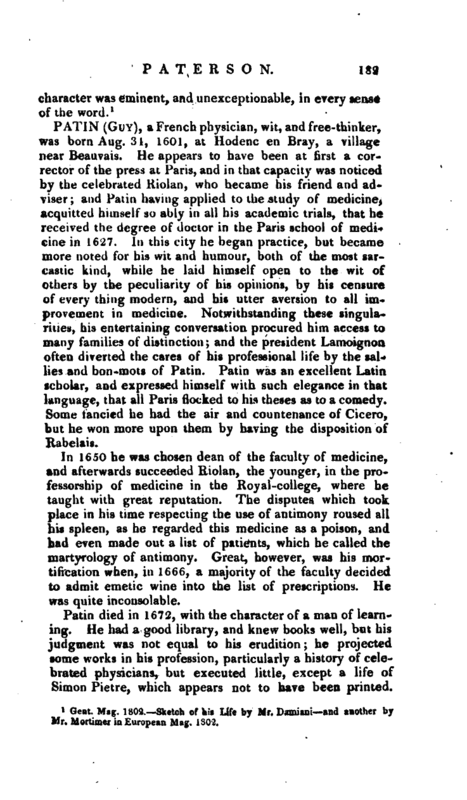 He appears to have been at first a corrector of the press at Paris, and in that capacity was noticed by the celebrated Riolan, who became his friend and adviser; and Patin having applied to the study of medicine, acquitted himself so ably in all his academic trials, that he received the degree of doctor in the Paris school of medicine in 1627. in this city he began practice, but became more noted for his wit and humour, both of the most sarcastic kind, while he laid himself open to the wit of others by the peculiarity of his opinions, by his censure of every thing modern, and his utter aversion to all improvement in medicine. Notwithstanding these singularities, his entertaining conversation procured him access to many families of distinction; and the president Lamoignon often diverted the cares of his professional life by the sallies and bon-mots of Patin.' 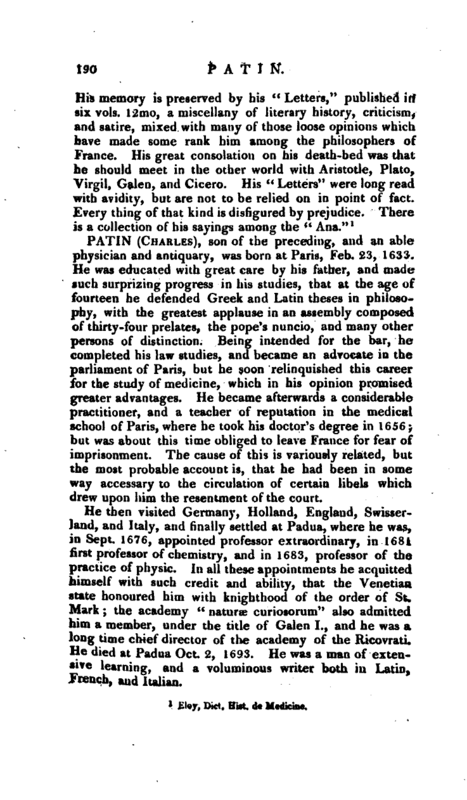 Patin was an excellent Latin scholar, and expressed himself with such elegance in that language, that all Paris flocked to his theses as to a comedy. Some fancied he had the air and countenance of Cicero, but he won more upon them by having the disposition of Rabelais. In 1650 he was chosen dean of the faculty of medicine, and afterwards succeeded Riolan, the younger, in the professorship of medicine in the Royal-college, where he taught with great reputation. The disputes which took place in his time respecting the use of antimony roused all his spleen, as he regarded this medicine as a poison, and had even made out a list of patients, which he called the martyrology of antimony. Great, however, was his mortification when, in 1666, a majority of the faculty decided to admit emetic wine into the list of prescriptions. He was quite inconsolable. 1 Eloy, —Dict. Hist. de Medicine.